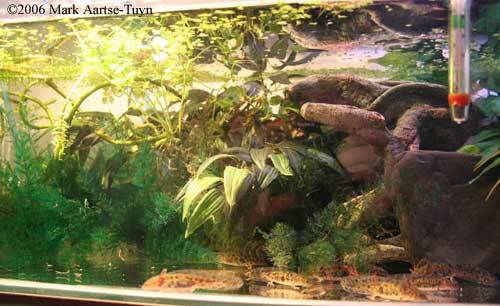 This page includes both fully aquatic tanks, and tanks with very small islands. 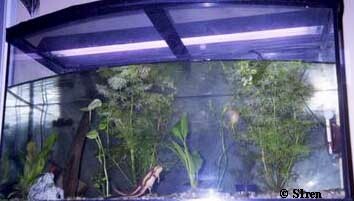 These tanks are suitable for caudates that never leave the water, or only rarely. 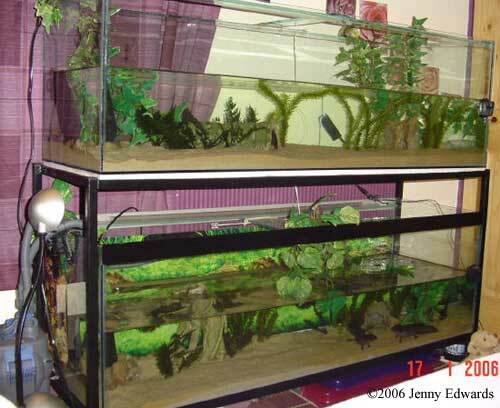 Comments: Two large tanks for axolotls. 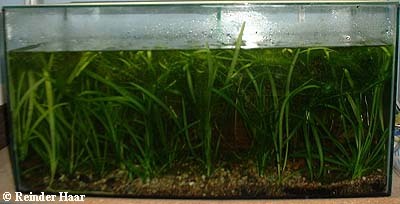 Substrate is fine sand, which allows planting of live aquatic plants without the risk of digestive impaction posed by gravel. 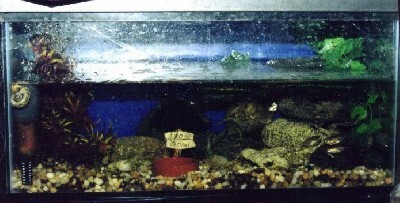 The above-water plants are artificial. Comments: A tank housing around 25 well grown larvae. 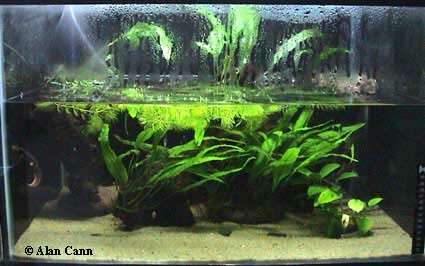 Artifical plants form dense cover to provide hiding areas during the day. Artificial ornaments and a handful of pond weed break the surface which morphs use to rest on during the night. 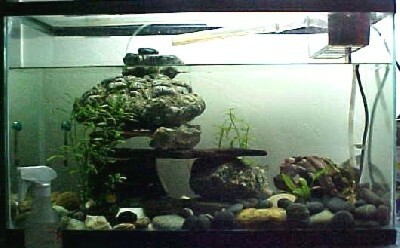 There is no substrate for ease of cleaning and a submersible filter, whose output is shielded by peices of slate stone. Comments: I keep about 35-40 gallons of water in it. All the plants are live. At the time of the photo, I had just clipped them all back, so it looks a little bare. Comments: The left side is densely planted and has a lamp so the plants would grow during winter as well. The center part is somewhat more open. Here you find the filter. This is also the part where they are fed. Comments: Densely planted with Vallisneria. No filter, just an airstone. 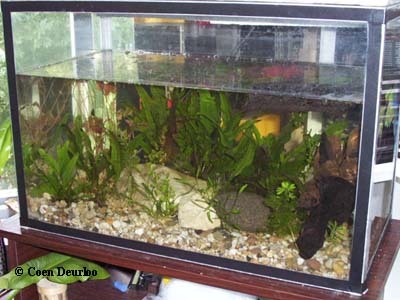 Comments: Includes small air-driven box filter, fine sand substrate, maintained at 20-25C. 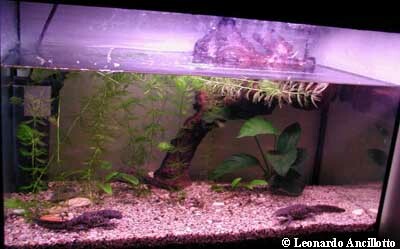 Planted with Java fern, Java moss, hornwort and Salvinia. 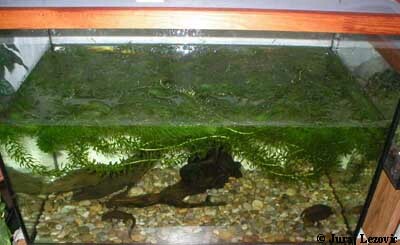 Bogwood and hornwort provide haul-out points, which the animals use frequently. Comments: Plants: Ceratophyllum demersum, Criptocoryne sp. and unknown species. Comments: There is almost no gravel on the bottom, only large smooth rocks. Plants: Elodea densa, Ceratophyllum demersum and Fontinalis antipyretica. Comments: This tank is similar to the other rock-island types. It was designed for Tylototriton verrucosus. 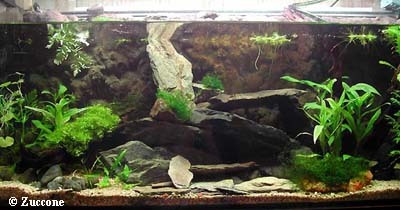 Comments: This aquatic setup has an undergravel filter with two overhanging waterfalls. It’s great for caudates that like some places to climb out, but climb out only rarely. Comments: This tank works for most fully aquatic caudates, like axolotls or sirens. It has a submersible filter hooked up to a homemade contraption that is basically like an overhanging waterfall. As you can see, it pours the water onto the rock-island. For more setup photos, see Setting It Up.